Since Feb. 12th, the Guardian has published five pieces either entirely or largely sympathetic to Ilhan Omar, after the congresswoman was forced to apologise for tweets widely viewed as antisemitic. The tweet, suggesting the only reason the US supports Israel is because AIPAC money buys politicians’ support, came on top of a 2012 tweet the freshman lawmaker was also forced to apologise for which accused Israel of “hypnotizing” the world to hide their “evil” ways. If you include a pro-Omar op-ed (published before the latest row), that makes six sympathetic pieces, with nothing published to date largely critical. The latest article, by US-based Guardian reporter Sabrina Siddiqui, featured comments by NY Times contributor Wajahat Ali, who, though mildly uncomfortable with the words Omar used in her tweet, claimed there’s a “target on her because she’s Muslim and black woman”. This narrative, that Omar was being criticised in large part because of her gender, colour and faith, was similarly highlighted in a Feb 4th Guardian op-ed by Mesrine Malik which opined, on the row over the 2012 “hypnotized” tweet, that “because she is a Muslim, and a Muslim’s place in western public life must always be subject to scrutiny, [Omar’s] opinions are distorted into a sinister shape”. The suggestion that Omar is held to a higher degree of critical scrutiny because she’s a Muslim women of colour is pretty much the opposite of the truth, as the reason she and fellow Congresswoman Rashida Tlaib received such positive media coverage when they were elected was due to their gender and faith. International press coverage after their November victories hailed the election of “the first Muslim women elected to Congress” – in the context of a record-setting number of women and minorities elected to Congress – as a “milestone” for America, with many outlets taking particular interest in Omar being the first congresswoman to wear a hijab. In fact, until the recent row over Omar’s tweets, the fact that both Tlaib and Omar are both pro-BDS, and that Tlaib is even more radical in rejecting the continued existence of a Jewish state within any borders, were downplayed or ignored. Further, Omar’s Feb. 1st tweet, which absurdly compared Israel to segregation under the Jim Crow South of mid-20th century America, received little MSM coverage. The glowing press coverage of Omar and Tlaib, and obfuscation – until the recent controversy – of their radical views is consistent with a media that often accepts the intersectionality and identity politics which imputes value to individuals based solely on desired racial, ethnic or gender characteristics. This ideology implicitly rejects the classic liberal view that people should be judged by the content of their character, not the colour of their skin. We say “desired” characteristics, because the intersectionality calculus prioritises (perceived) race, gender and sexual orientation, yet doesn’t give much ‘minority’ value to Jews, who are often seen, regardless of their skin colour, as “white” exploiters of black and brown people. For Guardian editors, being a Muslim woman of colour and anti-Israel almost guarantees you sympathetic coverage. But, even for serious media outlets, the likes of Ilhan Omar, at the very least, are all but guaranteed to receive a fair hearing – which is a good thing given America’s racial history. However, many of Omar’s defenders aren’t merely asking that she be treated fairly. Rather, they often seem to demand that such preferred minorities be granted a priori victimhood status, regardless of their personal histories, and the presumption of moral virtue, regardless of their behavior. Whilst Omar’s story, as a Somali immigrant elected to Congress, is inspiring, the excusing, obfuscating or erasing of her use of antisemitic tropes, based on an illiberal reflex in which her immutable traits trump reasoned discussion and universal moral standards, represents the very worst of the modern left. High Profile Muslims have NO RIGHT to wage Jihad in the US. at 2:15 Omar says the word “Hasbara” within the context of Al Quaida. I agree. Sadly her color would make her more likely to be an antisemite because in the USA about 34% of blacks are antisemitic as opposed to about 9% of whites. So it is not that she is being picked on and held to a higher standard because of her color, but that people in the USA of her color are more ready to accept hateful tropes about Jews. In addition, her faith of Islam includes within its holy book the Koran derogatory and hateful language concerning Jews and calls for them to be converted, killed or taxed and subdued and know they are subdued (subjected to constant humiliation). Ms Omar has not shown any understanding of this or acknowledged that kind of hate emanates from her own community and tried to break away from those awful sentiments. Farmer I really can’t fathom what Jews have done to you to elicit such hatred on your part. So, the Guardian wishes to grant Omar rights and privileges unavailable to mainstream Israeli politicians within its own pages stained with not just ink but the most obvious bigotry. Nothing surprising there. 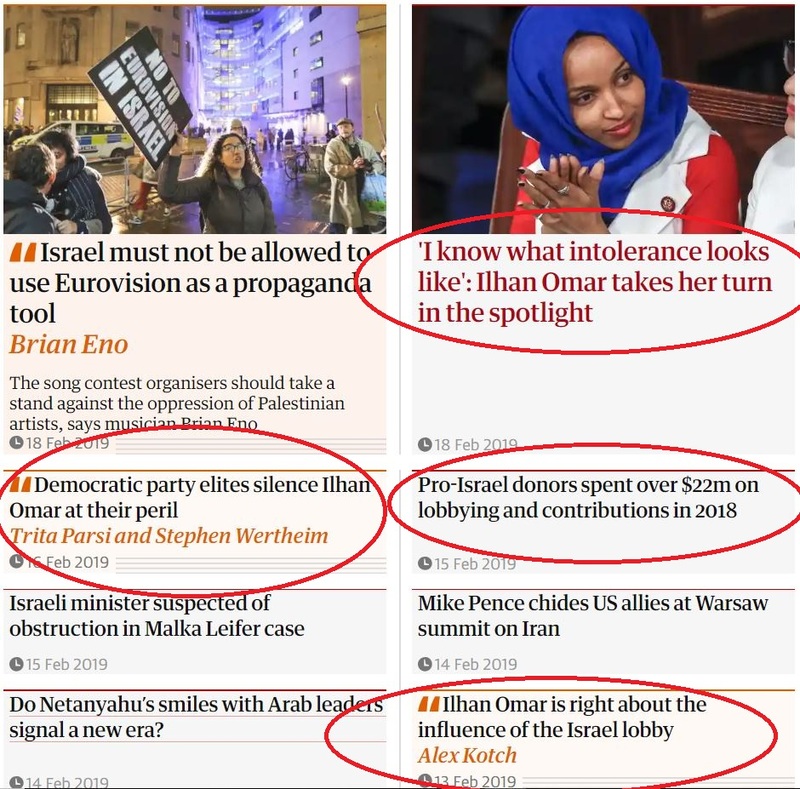 Criticism of Omar has nothing to do with the Guardian’s and intersectional left’s racist racism propaganda, but because of her obnoxious and false conspiracies about Jews and pro-Israel advocacy – conspiracies and antisemitic tropes which are shared gleefully by the Guardian (and found in the Protocols). Quite naturally the Guardian wishes to shield Omar and all other Muslims and far left lemmings who are upset about the continued existence of Jewish sovereignty in the land of Israel from all criticism. And it is they who are ready to bring back the Inquisition to do so. Their proclivity to project is just breathtaking. Let’s see what else they are doing. They are pushing the ever so popular meme of America, the world’s most diverse and successful democracy, as hopelessly racist – which is popular with all those wearing red underwear – and basically pushing the sick antisemitic idea that the “Zionists” are behind it. Then again, Jeffersonian democracy is not really the Guardian left’s thing, is it? This article is well researched and shows deep personel links to some questionable groups who give Omar money…. Illiteracy is another of Farmer’s problems.